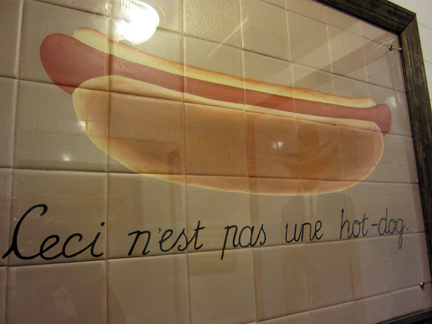 Above: a scene from my second-favorite hotdog joint in the world, Hot Doug’s. I won’t be able to get over there tomorrow while in Chicago for the day, but you can bet I’ll be eating my share of Chicago dogs! On a flight today to Chicago, where I’ll be attending the Pasternak Prestige Portfolio tasting: the nice folks at Pasternak asked me to come up and give them a hand with social media for the event. I’m always geeked to visit Chicago, the city where I was born and one of the most fun food destinations in the U.S.
Tonight, I’ll do some wine bar-hopping and I’ll catch with some of the awesome wine pros up there. Thursday, I’ll report back. Thanks for tuning in and see you on the other side! I’m jealous. This sounds like such a fun trip! Run, don’t walk, to Perman’s Wine Selections, 802 W Washington!